Every now an then I come across a children's product that makes me go, wow, why didn't I think of that! That's how impressed I am with the Tactile Tote. Tactile Tote is a brand of children's touchable bags that provides kids with a fun and safe way to meet their tactile needs - wherever they go or play! At home, in the car or at the store, children can find comfort at their fingertips! The Tactile Tote is a colorful, playful pouch that sits in the middle of a child's waist. With either an over-the-shoulder or around-the-waist adjustable strap, the tote is easily accessible to a child's curious hands. Kids can enjoy at least seven touchable materials on each tote. Collect "tots" to add more touchable materials! Each Tactile Tote is designed with a furry and colorful front and an "alligator" back. A zipper runs down the middle of the bag for added activity. The Tactile Tote is 6" x 9," fully lined and can hold cherished toys and treasures. 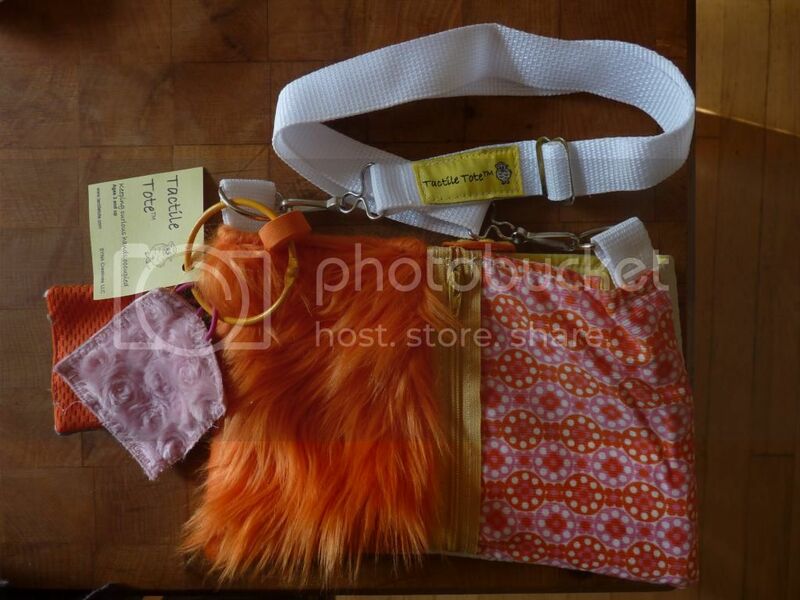 The Tactile Tote we received for this review is an over-the-shoulder bag in a pretty orange and pink color scheme. I wanted to keep it for myself! What makes the Tactile Tote extra special is the "tots!" A “tot” is a 3-inch square with a fun pattern and texture on each side. Each Tactile Tote comes with 2 tots, and you can collect and attach additional tots for even more tactile stimulation. I gave it to Marlie after I stopped playing with it myself (because mommies need a little soothing sensory relief too). She became so animated and exclaimed, "wow, it has furry on it! And a flower! Feel this part mommy!" Then she started to put stuff in it. 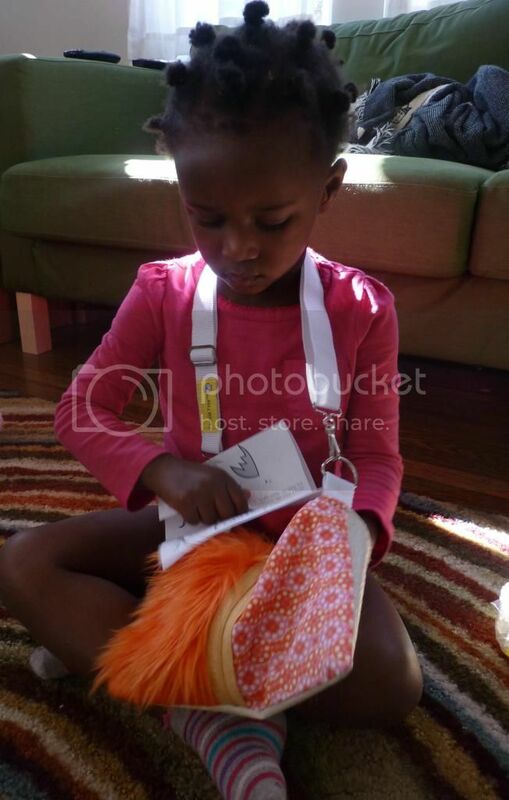 She is really into playing dress up, so this is a great fashion accessory that also functions as a sensory toy! When we go out Marlie makes sure to grab her purse too. I soon discovered the Tactile tote is great for long care rides because it engages her in sensory play that is both comforting and entertaining. Win It: Come back November 5-18 for your chance to win a Tactile Tote for your special boy or girl! Hint: leave a comment for extra entries! Sounds like a great toy and learning tool for the little ones. This would even be great for puppies but slightly larger I guess. They say to help really young puppies socialize the more surfaces they walk over the better. That is so neat and very cute too! I kind of want one for me! I know several kids who would enjoy the variations in texture and print. What a great concept! Ooh this is really cool! My nieces and nephews are a little old, but maybe my cousin's kids would like this... it would make a great holiday gift! I love this! What a great idea, I know a little girl who this would be perfect for... off to check out their pattern choices! that is an awesome product! I wish I had thought of that! My daughter loves to stash her "treasures" all over the place. I think this toy would be fabulous for her!! I think this is awesome, I tend to always forget to pack a bag of fun when on the go. Last road trip I was so worried about how my son was going to act in car, I was amazed that he was kept busy and content playing with this loose string on his sock. Then he pulled it off and kept running it across his lips. Its amazing how soothing the feel of something can be. This is so unique! I have friends who have children with sensory issues and this would be wonderful for them. My kids would get a kick out of it too because it's just plain fun. Such a clever toy and I love that it's for both genders. I don't usually carry a purse and we're getting out of the diaper bag phase but something like this would be helpful for Nia when we're on the train for a while! really.cute and a creative idea!!!! Love the idea f the tots t add extra textures! What an amazing idea! My youngest could really benefit from the Tactile Tote on long car trips. What an awesome product! I just found out my oldest has ADHD and my husband and I have been researching outlets for his expression, but also things to help him with comfort and feel his "place" in the universe. This would be awesome. What an amazing giveaway. Thank you! This is something that I probably would have thought of if I was creative at all, lol. This would be great for my little boy who has sensory issues. Always looking for stuff that will help him.